Can Isabelle earn her independence before the beast claims her? Isabelle certainly is in a predicament. She has little desire to follow her mistress into exile with Napoleon, but Isabelle couldn’t turn down the amount of money the Countess de Montholon was offering to pay her. At first, the countess seems silly, but harmless. However, as time passes, Isabelle begins to see a change in her mistress. I really felt sorry for Isabelle. She desperately wants to get away from her mistress, but as woman on her own, Isabelle doesn’t have many options. Her best hope is to continue to serve the countess for a while longer until she can earn enough money to safely make her own way in the world. I couldn’t help but wonder if the money Isabelle was earning was enough to risk her safety by staying on an island inhabited by a vampire. Isabelle is a strong woman with a plan for her future. The one thing Isabelle never counted on was falling in love. Saint-Denis, nicknamed Ali, wiggles his way into her heart. Unfortunately, Ali is a man with secrets that he isn’t comfortable sharing. Isabelle has a very hard time trusting Ali and even though she professes to be attracted to him, she never seems comfortable around him. Consequently, I thought the chemistry between fell a little flat for a majority of the story. This does improve a little bit toward the end as Ali opens up a bit, and Isabelle slowly learns to trust him. There are several villains at work in this tale, and I’m honestly not sure who the worst one is. Isabelle’s employers are truly terrible and have no redeeming qualities. The Governor is a dark figure as well, but he doesn’t seem to be entirely bad. Even though he has little regard for human life, he does seem to care for his wife and her daughters. However, the Governor definitely has some evil plans regarding the French. While I was certain his ultimate goal wouldn’t be accomplished, I couldn’t help but wonder if Isabelle would be a victim of one of his schemes. 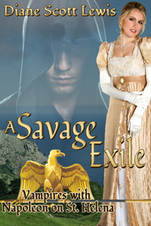 Overall, I thought A Savage Exile was a good book. Isabelle is likable heroine, and I enjoyed watching her make the best of a bad situation. Anyone who enjoys historical romance with a paranormal twist might want to check it out.